To read my latest blog on indigo “mat yom” click here. HAPPY NEW YEAR! 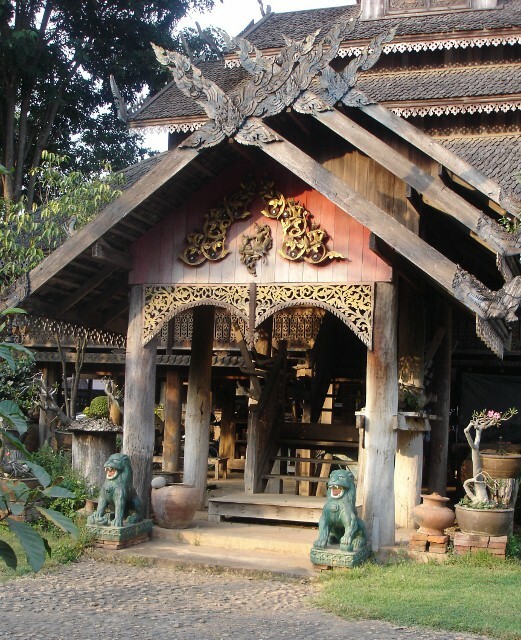 Just outside Phrae town (turn left at Tesco Lotus) is the village of Thung Hong. On the very wide, very hot main street, in amongst the usual array of motorcycle repair shops, unhealthy snack and sweet drinks shops and cheap noodle shops, are many shops all selling clothing in a deep, dark blue colour. 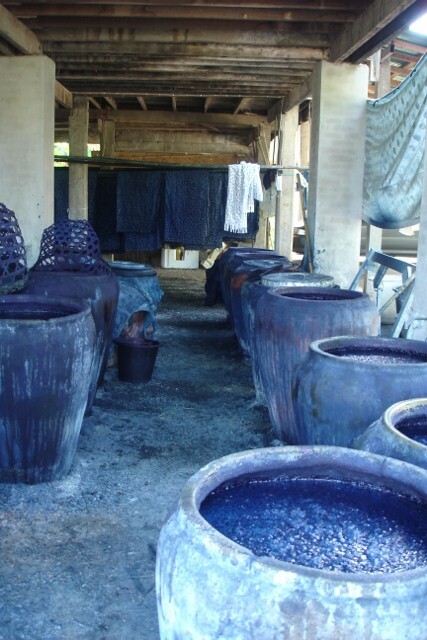 Thung Hong is famous for indigo. I first came here about 10 years ago. I had read that Phrae was the place to come for “seua mah hom” . 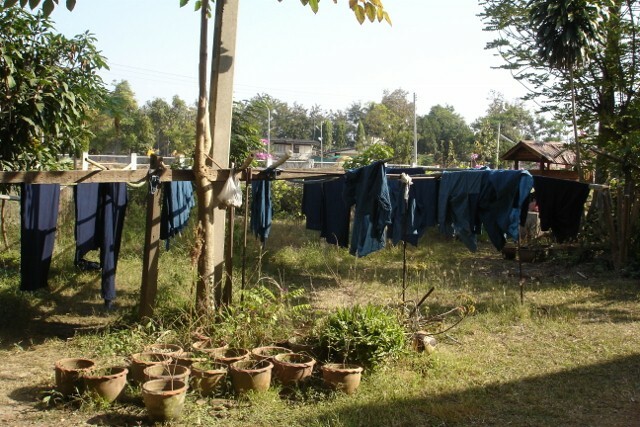 These are the dark blue shirts which were once worn almost universally in the north of Thailand (think Mao shirts). After much questioning of puzzled shopkeepers – me with no Thai, them with no English – I narrowed my search down to this village. I cycled out here along that aforementioned very wide and very hot main road with the highway traffic thundering past, and looked everywhere for the tell-tale signs of indigo; the big clay pots, the dyed cloth drying, the plants growing or even the pungent smell. Frustratingly I found nothing except the shops. So I turned off the road and cycled into the back lanes and soon to the open fields. I saw people wearing the traditional dark blue jackets and trousers but I couldn’t find anyone actually making it. On my way back to the main street, I looked across a small river and stopped dead in my pedals…washing lines full of indigo dyed cloth. I had stumbled upon the Paluang Indigo Home. Behind a traditional teak house on stilts I found to my joy lots of beautiful old clay pots full of indigo dye in various stages of fermentation. Nobody stopped me, so I carried on nosing about, and in an open building at the back there was a young woman block-printing on white cotton. 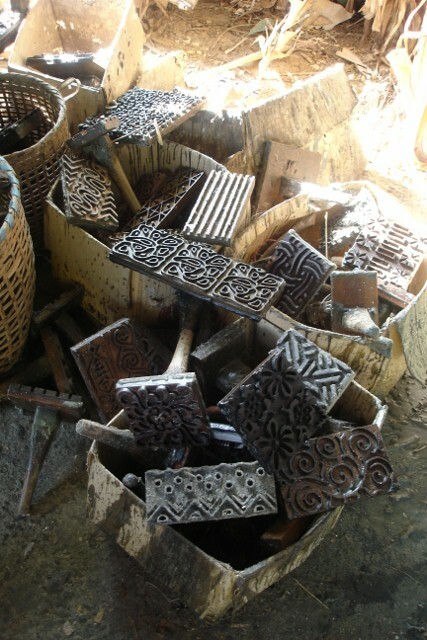 As I got nearer I could see that what she was printing was wax – she was making batik. Even better, she could speak some English, and we started to chat. Now every time I come to Thailand, I come to Phrae, and to Thung Hong village and to the Paluang Indigo House to see Panee and her family. Panee is about 40 now. She was born in the teak house on stilts and her parents and her grandparents were all indigo dyers – many of the massive pots of indigo were started before she was born. You could say she has indigo in the blood. Panee learnt to do batik at school but thought no more about it. She went away to university and then to work in Bangkok, but after a while she found that the pace of life there was just too frenetic. She bowed to the inevitable, came back home, married a local bloke and settled down to work in the family business. She soon realised that the business of selling almost indestructible indigo work shirts wasn’t a totally lucrative one and, what’s more, it was likely that the customer base would be a dwindling one. She was looking for a new angle. 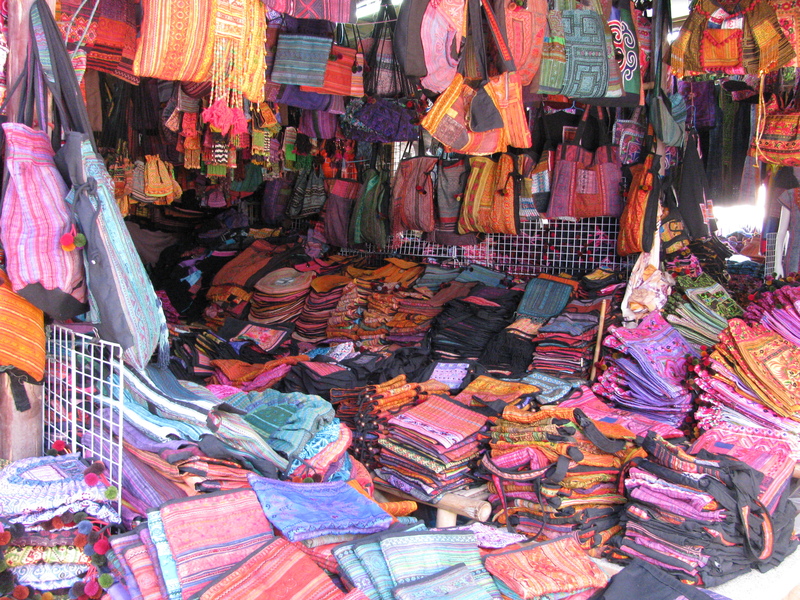 She decided to think again about batik which in northern Thailand is the preserve and speciality of H’mong women (you remember them from the last blog). She found that the tiny metal triangular tools they use to put the hot wax on are not suitable for the volume of fabric she had in mind. But what about all those lovely indigo shirts and jackets on sale in the shops of Thung Hong? I’m sorry to say that around 80% of them are made with chemical indigo in a huge factory in Bangkok! Indigo (Indigofera tinctoria) is grown intensively in the local area. The plants are at their height in the rainy season (June – September) and at the end of this, the family make their concentrated indigo paste. The dye bearing plants are cut down and steeped in water for a couple of days until the water turns a dirty yellowish colour. Lots of oxygen is added to the vat by beating, whisking, stirring and pouring until the water gradually changes to a deep blue colour and develops a very pretty light blue froth. The sediment from this vat makes a lovely sludgy deep blue paste which can be kept to make a fresh vat of dye when needed. With skill (and a little luck) an indigo vat can be kept “alive” almost permanently, it will just need waking up with a little more paste, some lime and wood ash. 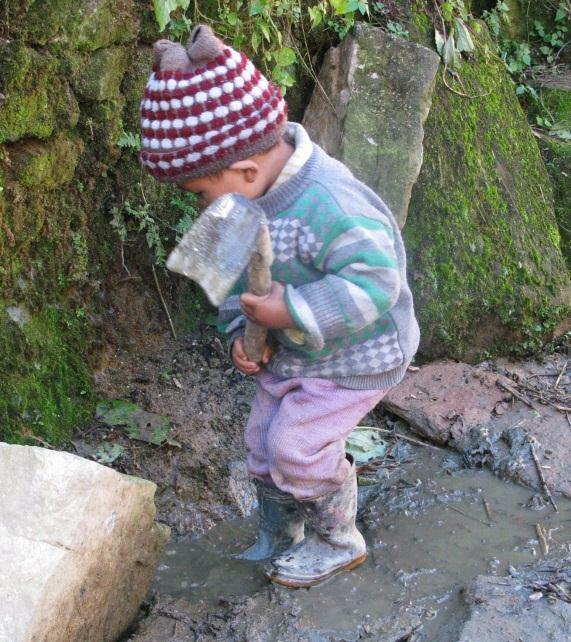 Panee’s family make about 2-300 kilos of paste a year. Nowadays with their increased business this is not enough and they have to buy in about the same amount again from indigo growers in Isan province. Queen Sirikit of Thailand is a wonderful woman and is a keen supporter of all kinds of Thai crafts. 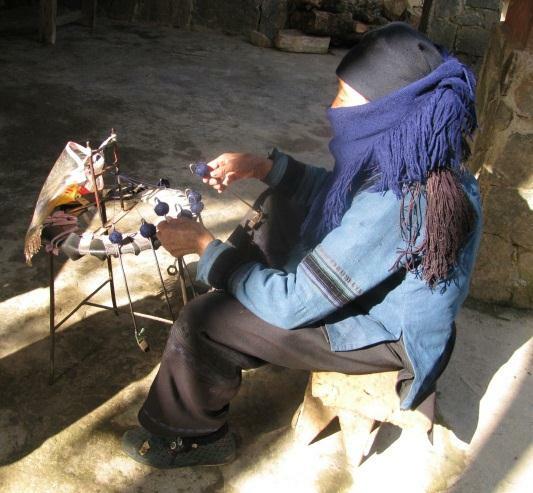 She has especially encouraged traditional textile skills, which are particularly close to her heart. Under her patronage, a very successful scheme, adopting an original idea from Japan, called OTOP (roughly “One Village, One Craft”) has been set up. 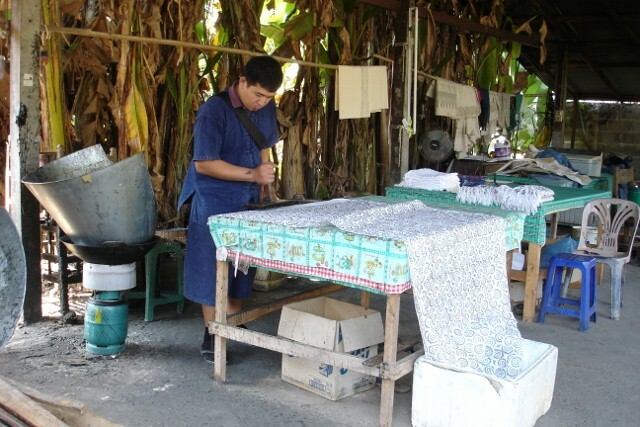 There are OTOP shops all over Thailand and they’re a very good way to market hand-made craft items. 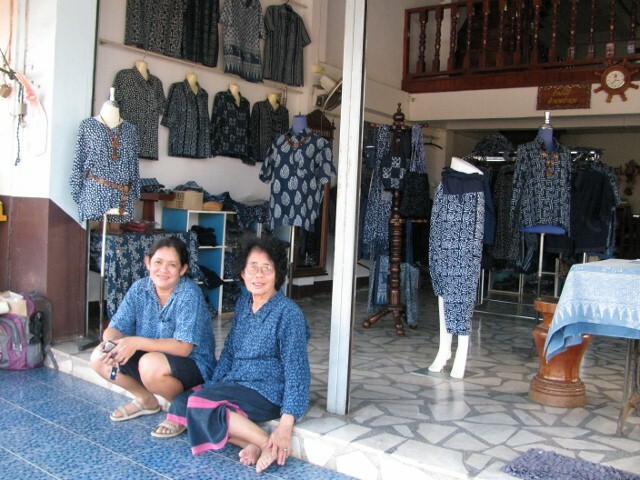 The Paluang Indigo batik is marketed through OTOP. Panee’s mum is getting a bit forgetful these days but in her prime she proudly carried the title of “OTOP Village Champion”. 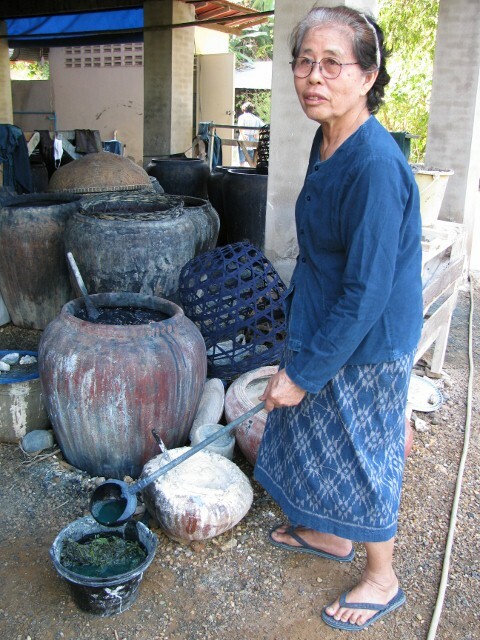 This means that she was asked to teach other people how to make an indigo vat and how to dye a good deep and consistent colour. She has taught local women from the village, hoards of local high school kids, and most memorably one of the Royal Princesses has had a dip in her indigo vats. You used to go upstairs in the teak house on stilts to buy things but nowadays there’s a proper shop out front. There are jackets, and blouses, kimonos and men’s shirts and even batiked tissue boxes on sale. Sometimes they may have some traditional “mawhom” work shirts. These are a deep black-blue colour and fastened with ties or cloth buttons, at the front. The size is marked in white chalk on the back. They are extremely hard wearing – made for a time when people had very little cash to spare. Some people in the area still wear them every day, working in the fields or at the market. They seem to last forever and look better and better as they get older – just like a pair of your favourite jeans. beautiful cloth and the fabulous state of those indigo pots with their light blue froth or deep green water or vibrant blue sludge, one of my favourite things at Panee’s home is the visitor’s toilet. 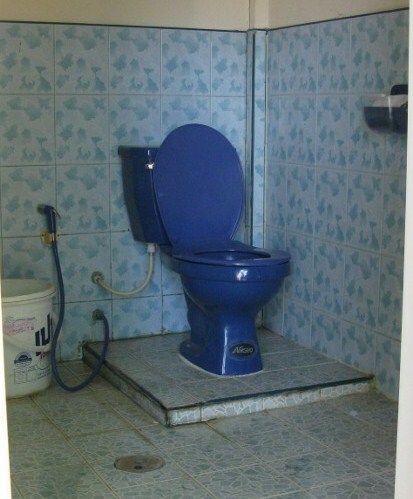 Its indigo blue – now that shows dedication! It’s easy to love northern Thailand and Chiang Mai in particular and many people do. It’s easy to relax and start feeling that you could stay a few months and maybe even join the many ex pats who have made their temporary or permanent home here. Start to think about finding a way to make some money and getting a work permit (and you don’t need to earn much to live here) or getting a retirement visa if you’re old enough (and I am, hooray!) or even just joining the queues at the Burmese or Laos border every two weeks to renew your tourist visa. And of course getting yourself a Thai girlfriend which is what just about every middle aged single man is doing here. In the interests of sexual equality I must report that of course as a middle aged single woman you could come here for a Thai boyfriend too, but it’s just that you don’t see that in every bar or café and on every street. Yes, Chiang Mai seems to have mastered the art of pandering to the needs of the farang (the foreigners) in every way. There are umpteen cafes selling cheap and delicious Thai food or huge English breakfasts or mango and bee pollen smoothies – whatever your particular penchant happens to be. And on top of that don’t forget the yoga sessions, the thai massage schools, the cooking classes, the trekking, rafting, elephant rides, meditation retreats, mountain biking, and what have you. And the Thai language courses – which is how I’m spending my weekday mornings. Sitting in a classroom being given vocab lists and practicing the five tones and the long and short vowels may not be every one’s idea of a good time, but I am enjoying it very much, thank you. But it’s not all sweetness and light – most of the “farang” here are polite and cheerful but still the Thais must get fed up of us. My guesthouse landlord confided in a private rant to me the other evening – he began by expressing his amazement that we would come here on holiday and then pay good money to spend a day COOKING?! And then proceeded to a general rage at having to smile constantly and answer the same questions over and over from dumbass tourists. In the end I wrote a big sign for him and told him to just point! So what am I doing here? Between my morning Thai class, my evening yoga sessions and regular Thai massage in my local temple, I am very busy whizzing around the alleyways and back streets on a bright orange rented pushbike. 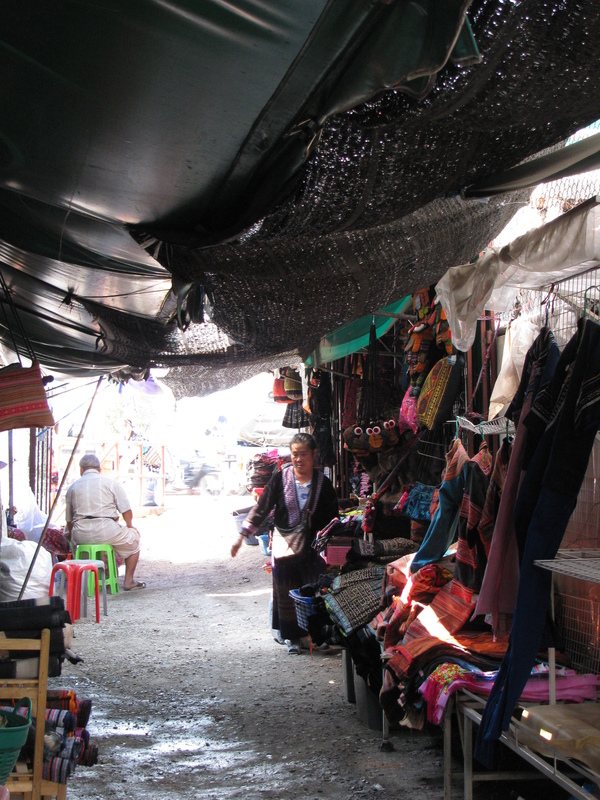 I have settled into a regular routine – usually first down to the “H’mong village” at Warorot market. This is the section of the market where the H’mong tribal people have set up homes, where they watch TV, play with their kids, make clothes and stitch and embroider and sleep amidst their huge piles of somewhat tatty hilltribe embroideries and pleated skirts. This has all been developing in the past 5 years or so into a full on neighbourhood, and now I join the other traders (Thai, Japanese, other westerners) who are there most days riffling through the piles to see if anything catches our eye. Poo’s tailors make clothes for me, so most days I am there with my fabrics and my bits of hilltribe embroidered scraps and my patterns and samples, working things out and ordering or collecting. We can compare notes on what we paid for stuff, how the price of cotton is going up and the quality of hemp weaving down, have a laugh at the soaps and my crap Thai and share some mangosteens or other exotic fruits. At the weekends the shopping doesn’t end, it just changes location – at the end of the road where I’m staying, the famous Sunday “Walking Market” sets up. From 4pm onwards the traffic is stopped, the roads are lined with stalls, the temple courtyards are full of food stalls and the road is thronged with people enjoying the atmosphere and the shopping. 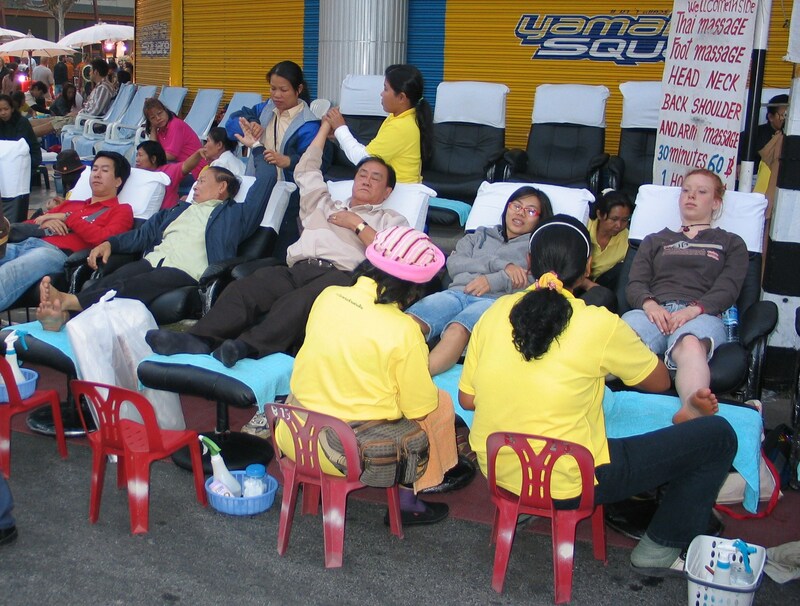 If it all gets too much you can stop and get a foot or shoulder massage at one of the massage “parlours” which get set up on every corner. So that’s my particular version of Chiang Mai – but there are so many others… girly bars and pool tables, reggae bands and beer, meditation and massage, sausage and chips and Premier league football at the Irish pub, cocktails and candlelit dinners, ancient temples and golden Buddhas, tennis or a round of golf at the Gymkhana Club. 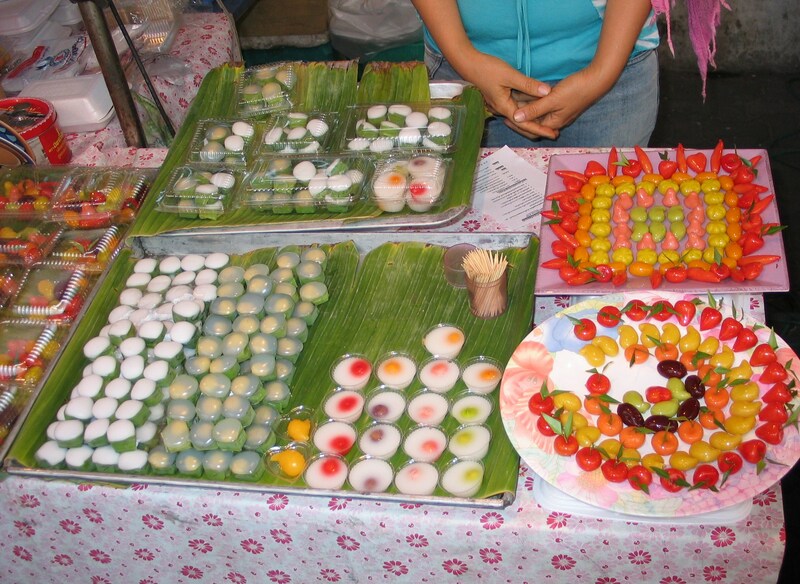 You name it, Chiang mai has it all! I’m not sure what it was but it took me a long time to start enjoying Vietnam. Maybe it was just a bit of an anti-climax after the never ending variety and daily surprises of China, maybe it was the feeling of being constantly on my guard or maybe it was just the weather – mostly grey skies with hazy indistinct views and surprisingly cold! Herrumph …I was hoping we’d finally left that behind. In the mountainous north where I just know the scenery would have been amazing if only we could see it, the temperature was bone chilling. The titchy electric blanket was very welcome but it did mean the only warm place was in bed. 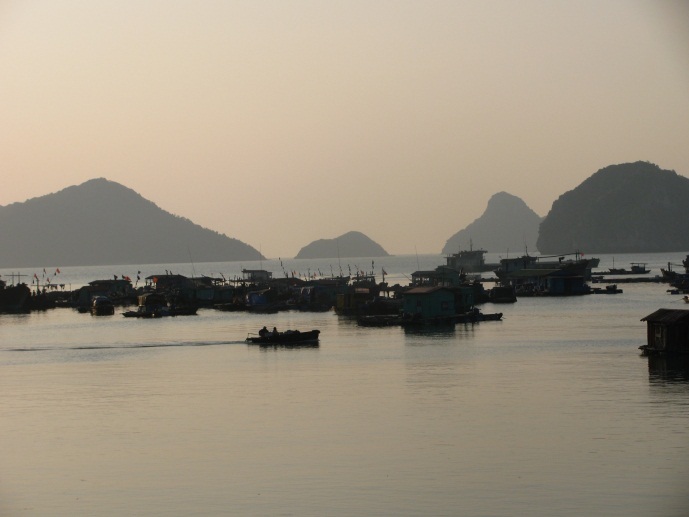 So we swiftly headed for the coast and were looking forward to enjoying the world Heritage karst islands of Ha Long Bay. We had two tempting days of sunshine to enjoy the kayaking and the seaside before a still becalmed grey chilliness set in. The floating town of over 4,000 people who make their living from the sea around here is an impressive sight but it does mean that there’s hardly any marine life to look at. Snorkelling? Not much point. As we went inland we had more tantalising glimpses of magnificent karst mountains rising up from rice fields, rivers and fishing villages. 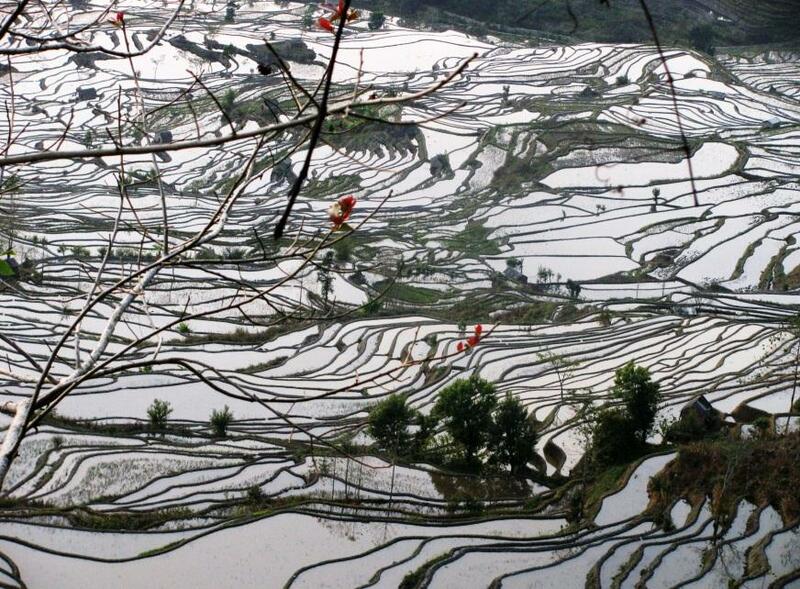 The people there again make their living from the water – ducks, fish and rice, but we couldn’t see a lot of it. 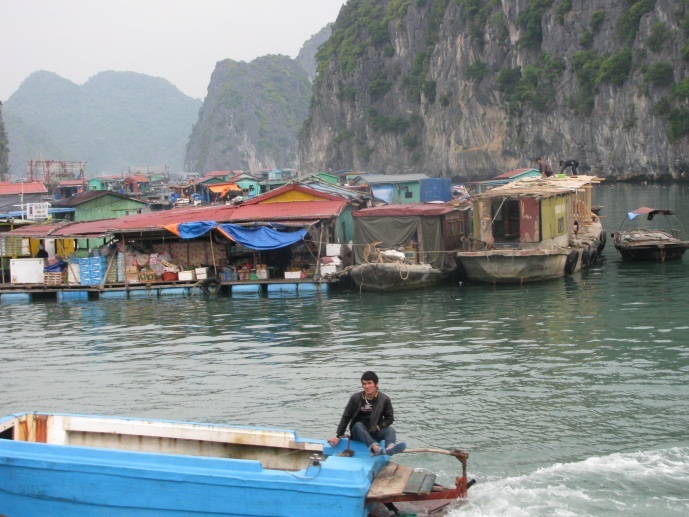 But I should stop moaning about the weather – what about Vietnam itself? Well I can only speak for what we saw (northern parts) but it was … just a bit boring. The countryside is despoiled with industry and half-finished road and building schemes, the towns are scruffy with piles of rubbish and construction materials, and ugly great shop signs everywhere. The people look just a bit boring too – no glitter and glam like in Uzbekistan, no embroidery and polished indigo like the hill tribe people, no exotic robes like the Tibetans, not even any goths or punks or daft emo haircuts like in China. Almost everyone wears an anorak (puffa jackets by the thousand!) and jeans, and drives a scooter and wears a face mask. The most exotic it gets is the occasional woman wearing one of those archetypal bamboo “coolie” hats. So I have to admit I was feeling just a bit disappointed by it all until we got to Hanoi. Finally I was charmed. The old part of the city is full of slightly dilapidated colonial architecture – tall yellowish buildings with green shutters and little balconies, old neighbourhood temples, markets and street cafes where you sit on a mat or a tiny plastic stool at best. 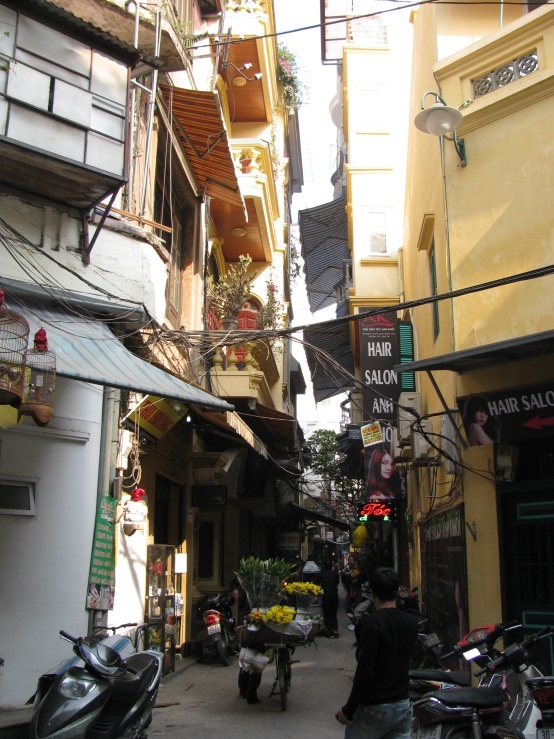 Hanoi manages to retain the charm of old Asian city street life which used to exist all over Asia, and which China in particular has been assiduously demolishing as fast as it can. So there it is – Hanoi, city of a million motorbikes and every one of them seems to be coming towards you at the same time! So now I have to choose a textile to represent Vietnam. 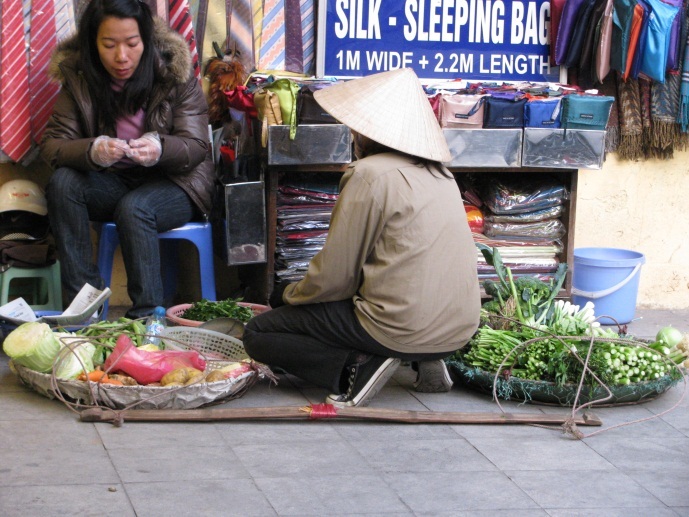 Most of the population here is Vietnamese but the problem is they don’t really go in for handmade textiles – unlike everywhere else we’ve been. Yes, there’s a bit of hand embroidery and some silk production but it doesn’t compare to the countries around it. 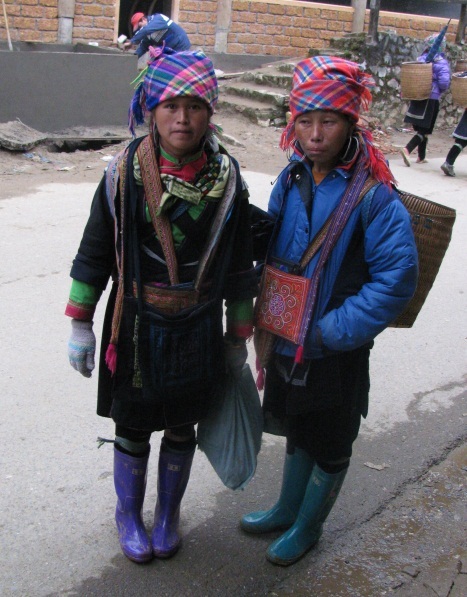 There is another population living in Vietnam though – around 55 different ethnic minorities, mostly living in the north, and they are a very different matter. Just like in China, they wear and make stunning costumes. 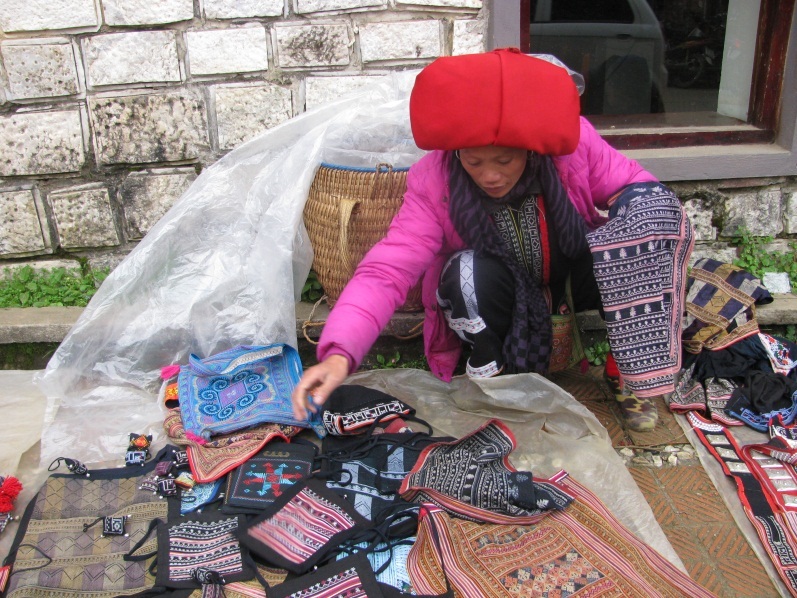 So my chosen textile is a pair of embroidered trousers which I bought from a red Yao woman in Sapa. She may live in Vietnam but she probably doesn’t speak much Vietnamese or feel that she belongs to this country, and as a minority she and her family are not treated the same as the Vietnamese. 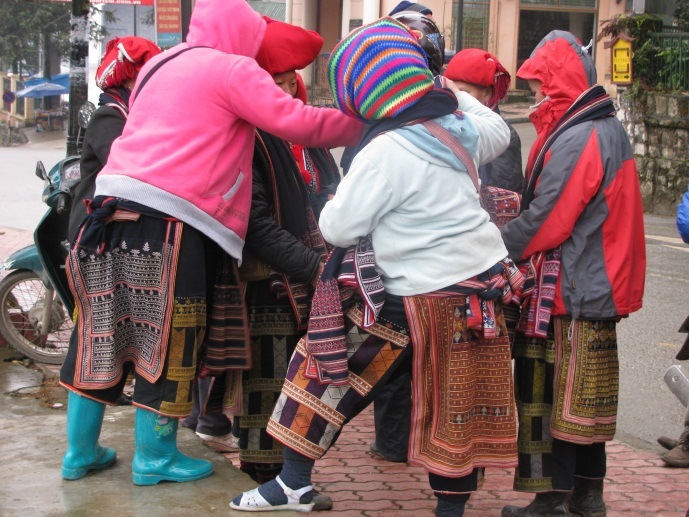 Sapa was the first place we went to. We crossed the border from China over the Red River and climbed a steep 38 kilometres to Sapa, which was used as a hill station by the French back in those pre Vietnam War days. We stepped out of the minibus into thick drizzly fog and it was freezing cold – well everyone told us it would be. There’s a lake, a church, a market, and lots of hotels, cafes, restaurants, and French bakeries for all the tourists. Most strikingly there are hordes of extremely colourful hill tribe women. 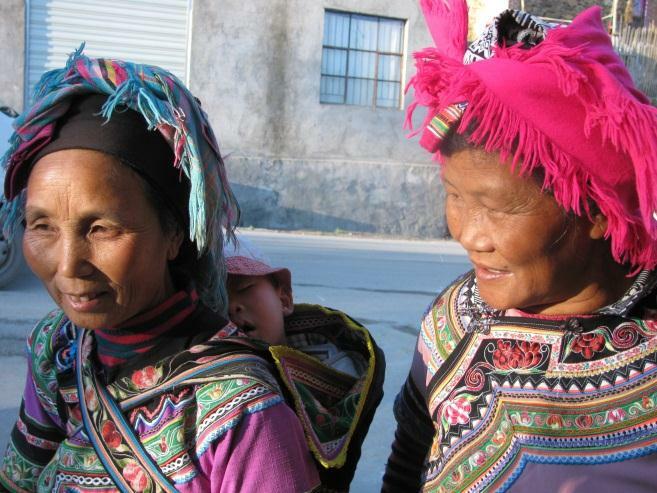 The women here are mostly Black H’mong who wear pleated skirts, black turbans and polished indigo jackets or Red Yao with fantastic embroidered trousers, big hoop earrings and huge red headscarves. What they all have in common is that they are tiny, undernourished and they are not wearing enough warm clothes. On their feet they’ve got cheap wellies at best or plastic bags and flimsy plastic sandals at worst. That’s it! As soon as you show any interest they’re all on top of you. If there’s anything I can buy I will, but with the best will in the world I cannot buy something from the whole lot of you and I absolutely will not buy any of those hideous bright yellow and green over dyed cushion covers you keep waving in my face. So I buy a few embroidered bags – but this only leads to “You buy from her, you buy from me”. Finally somebody has something that makes me stop and look – a pair of traditional embroidered trousers. A bit dirty and patched but the embroidery is very fine and oh joy! they have escaped embellishment with bright pink or fluorescent green wool. So now our protracted relationship begins. “How much for the trousers?” – a ridiculously high price from her, a ridiculously low price from me – gasps and laughter from the crowd. Can I really be bothered with this? As I walk around town she’s still trailing me, hanging around while I get my lunch in a lovely warm cafe. Another slightly lower price from her and a slightly higher price from me. “They make by my mother – she at home, long time to make, she angry with me if I sell too cheap. I been here three days, not sell anything. You buy from me and I go home.” Talk about emotional blackmail! But look at her, she’s cold, it’s cold, and maybe if I buy them it will make her day. Finally a mutually acceptable price is found. I hand over the money and wait for a smile. “You happy now? Good – now go back home and get warm for goodness sake”. 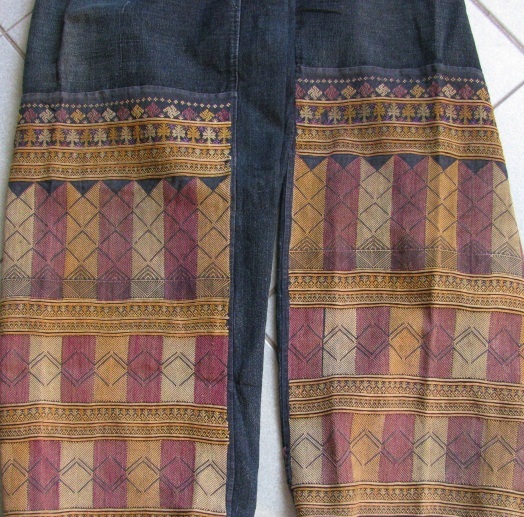 Half an hour later, I go into a shop selling ethnic costume and see a pile of embroidered hill tribe trousers, very much like the ones…. How much are they? Exactly the same amount I have just paid – all without the haggling and the bargaining, all without being trailed and hassled and all without feeling extremely guilty. But also I suppose without getting some insight into the life of a dirt poor hill tribe woman trying to make a bit of money on a cold and foggy winter’s day. 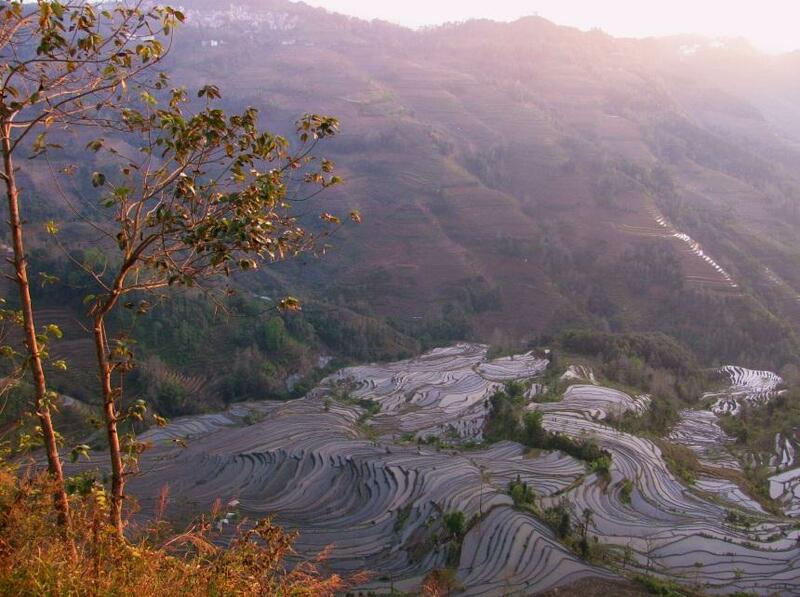 Well, I have seen some rice terraces in my time, but the ones at Yuanyang take the biscuit! I think I can safely say that this is one of the most beautiful manmade landscapes in the world. The trick is to get here when the weather is clear and the view unobscured by clouds – which can descend at a moment’s notice. We arrived in swirling mist and we left in thick freezing fog but in between we had two beautiful days. 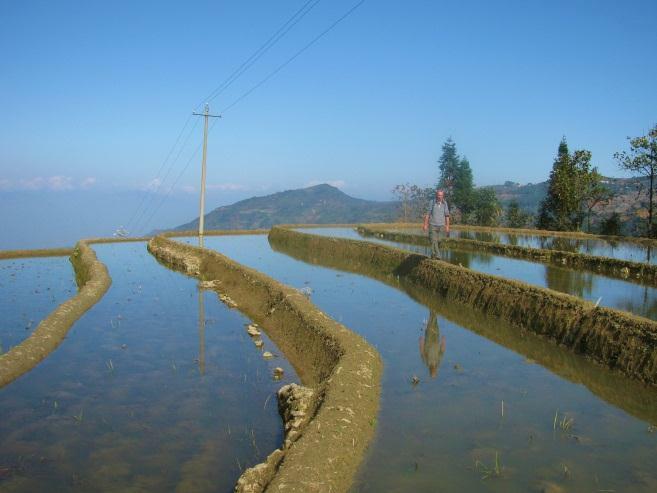 These fields are probably lovely at almost any part of the growing year; bright green with fresh new rice, golden with mature rice ready to harvest but right now they may be at their best, flooded with water for a few months before planting begins in March. There is not much point saying anything as the photos say it all (sorry but you’ll have to see just a few of the dozens I took) Our “Sunny” guesthouse had a sublime view and we spent hours gazing out at the beautiful patterns the sky, clouds and light make. 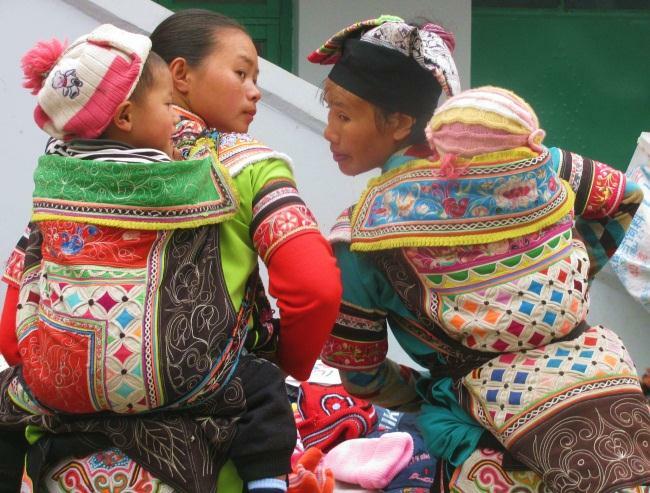 Oh yes, and the hill tribe women in these parts wear a wide variety of lovely garments too – some pink with lots of embroidered embellishment and others dark and subtle. The old ladies and the old chaps still wear real indigo jackets and waistcoats in layers but the younger ones go for the ready-made ones they can buy at the market. Nevertheless lots of women are still busy making textiles – indigo dyeing, stitching and embroidering, knitting, spinning yarn and braiding – the first I’ve come across so far. 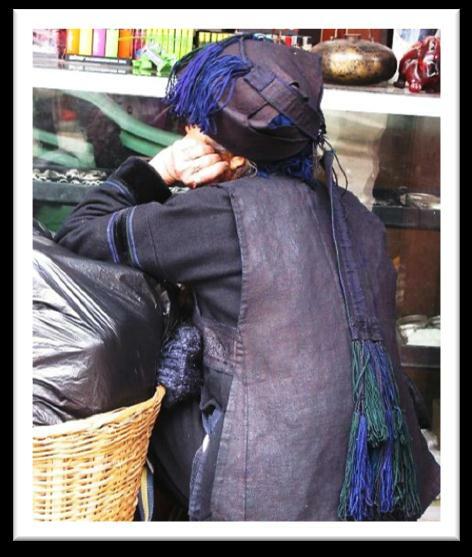 They are making very fine thin braids which are sewn onto the ends of traditional indigo head scarves. The hundreds of metres of braid hang down like thin dreadlocks. We managed to buy one of the lovely indigo waistcoats the old ladies wear – it was on a stall we didn’t just wrestle it off someone’s back. The local market was one of the best, the rice fields are better than they were cracked up to be. So what’s the catch? Only the Chinese Tourist Board’s insistence on building viewing platforms in the best spots. Then they can charge you to watch the sunrise or the sunset! But luckily there are usually a few friendly locals around to show you the way to get a great view for free! Now that’s what I call a view!